When I step on the dive boat, The Wetter the Better, I immediately feel at home. This is one of my favorite boats to dive in South Florida and it is also the boat I take my family and friends who want to go on a fun scuba adventure. My dad was visiting from Tacoma, WA to enjoy some of the tropical underwater fun that I am always telling him about while he is up north in the cold, wet, and grey Pacific Northwest. We dove two reefs on this day. Our first site was Flower Gardens. We had a mild north current and drifted with our dive master who carried the flag and pointed out wildlife. At a place called fish bowl, we saw the usual massive school of grunts. I love this spot and especially when you find a turtle swimming or resting in the middle of all the hundreds of fish. We drifted over a big Loggerhead sea turtle who had her head tucked in the reef taking a much-needed nap. As we continued along the reef, I noticed the dive master pointing out toward the sand. I could not see anything so I positioned myself so that I would drift over the area she was pointing towards. Next thing I know I saw the nose of a shark heading straight for me. The shark got about 3 feet in front of me before making a sharp turn. It was a pretty nice rush to see a shark heading straight for me. I was amazed to discover that it was a Sandbar Shark with his entourage of tiny bait fish that were swimming on his nose. 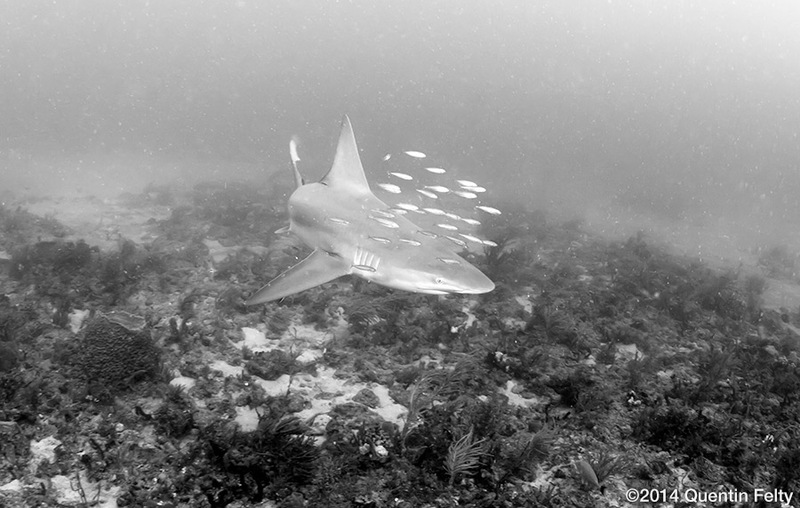 I’ve seen Sandbar sharks in Jupiter, FL., but this was a surprise to see one down this far south, and even more special was to see this shark up on the reef with no chum in the water. As we continued drifting along, we spotted a Hawksbill Turtle who was feeding on a sponge. 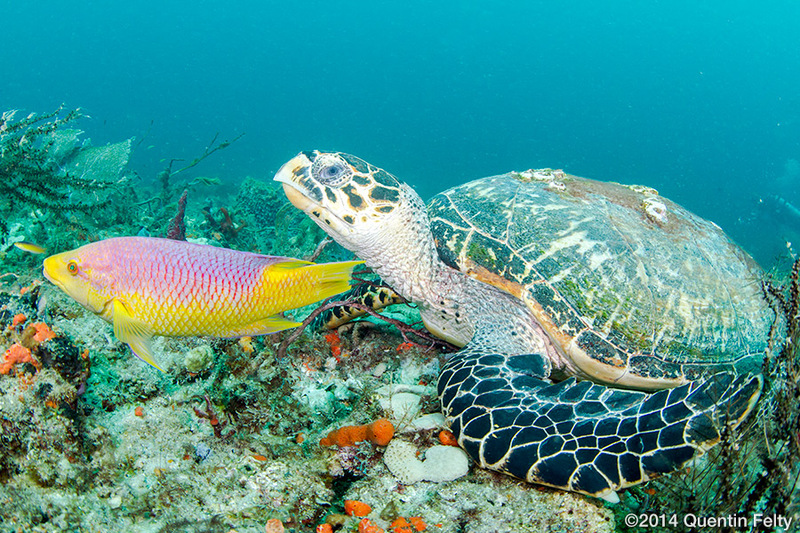 This turtle had a Spanish Hogfish who was dining with him. It was an awesome moment to see different creatures in harmony and sharing the same ecosystem… and it made me more mindful of how I live and treat our planet. Half-way through the dive our dive master, Allison, found a beer bottle and collected it to be thrown away on the boat. That’s another thing I love about this boat — the crew is friendly, attentive, and professional. They genuinely enjoy diving and do their best to protect the reefs. I’ve seen them collect trash, i.e. monofilament, plastic bags, bottles, etc. Ironically, Allison used the Corona (Latin for crown) beer bottle to point out her awesome find — a Gold-Crowned Sea Goddess. Don’t get me wrong I loved taking photos of the turtle and shark already seen on this dive with my wide-angle lens but at this moment I wished for my macro lens. It made for a fun and challenging close-focus wide angle shot. Some of the most colorful and amazing creatures on the reef are tiny and easy to miss. 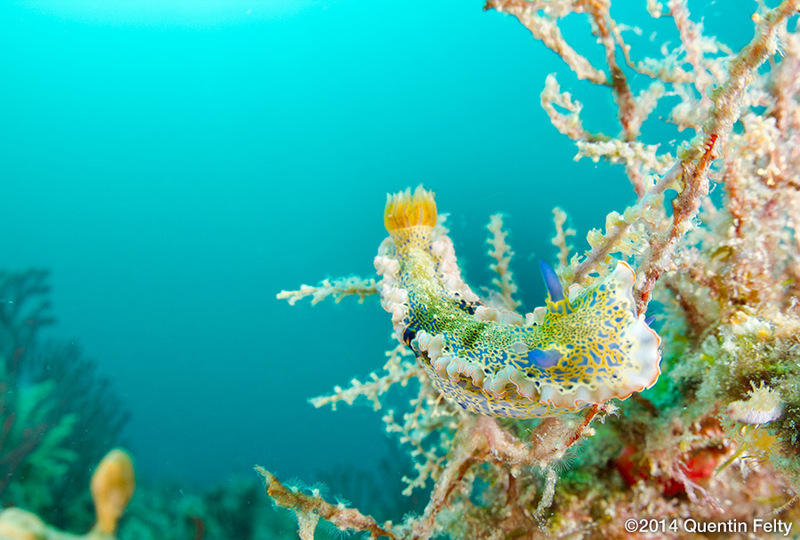 Thankfully our dive master spotted this lovely nudibranch. Before the end of this dive I drifted over a large 8 ft nurse shark. Two species of shark on the first dive. During our surface interval the boat was full of dive chatter about all the cool things we saw and how our dives could not get any better. Everyone was all smiles. We were all treated to some spectacular homemade blueberry muffins and then we got ready to go back down. Our second dive was on Breakers reef where we saw our third species of sea turtle — a beautiful green sea turtle. They have such beautiful and shiny shells. This reef is such a treat to swim along and look under the ledges where we saw some eels and lobsters. The huge barrel sponges, sea fans, and soft corals covered in tropical fish make you think you are in the Caribbean, but the best part is you are here in the USA. During the dive a person up current of me was pointing and waving her arms like a pair of wings. I immediately thought it was a spotted eagle ray. I kicked against the current to see what it was and I saw what I thought was a large spotted eagle ray. As I got closer I could not believe my eyes it was a Manta Ray. I have not seen a manta ray in Palm Beach so this was an incredible experience. 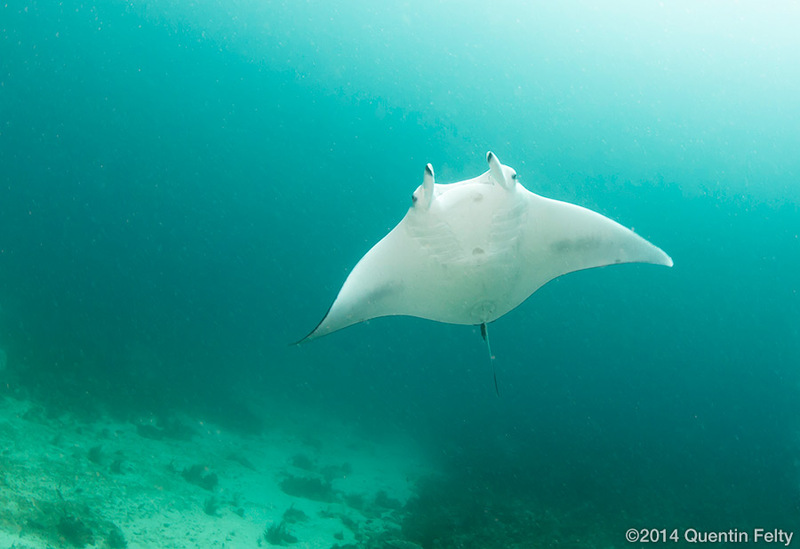 I positioned myself so I was right in front of the ray and it gently rose and swam above me. Wow! The diving just kept getting Wetter and Better. My dad and I eventually were at the surface. We heard Allison’s group when they surfaced full of excitement. Guess what they saw on their safety stop? Dolphins! Ok. Epic dives, great vibes, and a wonderful group to experience this here in sunny Florida. Many thanks to Captain Bill Walker and his wonderful crew for helping my dad and I share some spectacular moments underwater.